Geared motor manufacturer Parvalux has invested £1 million into a new production facility. Expanding on its current 45,000 sq ft facility, the Bournemouth-based motor maker has developed a further 20,000 sq ft.
Cellular manufacturing has also been introduced across many product lines using lean principles. Using advanced workflow modelling, standard lead-times have been reduced such that even customised products can now be manufactured in less than four weeks, the company says. Parvalux, the UK’s biggest manufacturer of small geared motors, has a flexible workforce of up to 240 employees and says it is now capable of producing 500,000 motor units annually. 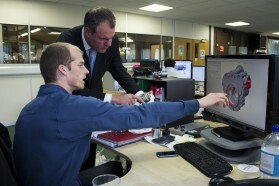 Conor Burns, MP for Bournemouth West, recently opened the new facility. “We all talk about diversifying the UK economy away from finance and it’s right under our noses. Parvalux is an incredible manufacturing company,” he said. Dr. Martin Mathias, Parvalux’ technical director, said “We have developed a multi-disciplinary approach to modelling new designs using the latest software. The result is that we can rapid prototype completely new products in a matter of weeks. exports over 60% of its product globally.